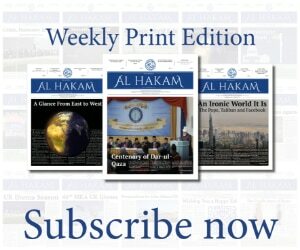 Alhamdolillah, after a long period, Al Hakam newspaper is being launched online. Al Hakam bears great significance in that it was the first newspaper of the Jamaat, established during the life of the Promised Messiah, peace be upon him. 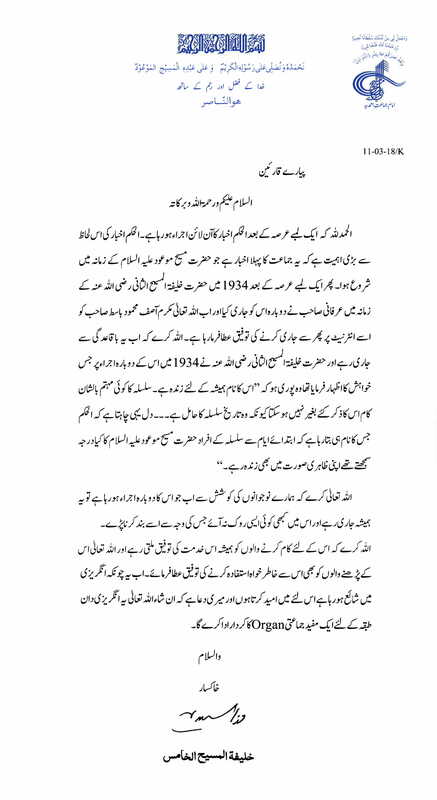 Then, after a long interval it was re-established in 1934 during the time of Hazrat Khalifatul Masih II, Allah be pleased with him, by Irfani sahib. Now, Allah the Almighty has granted the opportunity to Asif Mahmood Basit sahib to launch it once again, on the internet. Now that it is being relaunched with the effort of our youth, may Allah enable this newspaper to remain forever and may it continue unimpeded so that we never see its termination. May Allah always help those who work for this newspaper and may Allah the Almighty also enable its readers to derive true benefit from it. Now that it is to be published in English, I hope, and it is my prayer, that it will prove to be a beneficial organ of the Jamaat for the English readership, Insha-Allah-Ta’ala.